Game Information: Life doesn't get much sweeter than Sugar Parade, a 5 reel, 15 payline online pokie powered by industry leaders Microgaming. This fantasy/candy themed game is not only fun and visually appealing but rewarding as well. If tasty treats and sweet snacks are your thing, then Sugar Parade is just for you. The colourful graphics and cute sound effects only add to the appeal of the game, while the exciting rewards will please both new and experienced players alike. Powered by Microgaming, players can expect a top-class gaming experience. Sugar Parade is available to play on all devices, including mobile, with a betting range starting at just 0.15 a spin, while an exciting bonus feature and a lucrative free spins feature adds to your bankroll in an impressive way. In fact, players can expect a delicious payout of up to 1,658 times your initial bet. The game is low variance, making it a good option for all players, while an RTP of 97% guarantees great payouts at every turn. Sugar Parade is an easy-to-play slot game that features a coin size range of 0.15 to 75, plus a decent jackpot of 8,000 coins. The game also features two exciting bonus round plus a wealth of free spins to be won – up to 20 – making this game more than just a sickly sweet feast on the senses. The most lucrative part of the game is definitely the bonus round, while the symbols also add to your bankroll. Trigger the free spins round for a chance to enjoy some exciting rewards. Once you decide to try your hand at this exciting game, you need to start by placing your bets. This can be done by clicking on ‘Bet’, where you can set your coin size, while clicking on ‘Coins’ will help you set the number of coins per line. Once you are ready, press Spin and the game will begin. There is also an Autoplay option that allows you to set the number of spins you would like to play automatically. The Max Bet option automatically places the maximum bet for you without having to set it yourself. In addition to stunning visuals, Sugar Parade also boasts some thrilling bonus features to boost your chances of winning big. Picking Game – The Picking Game feature is triggered when you land three or more King bonus symbols on a payline from left to right. Once triggered, you will be transported to a second screen and given three, four or five picks, depending on the number of symbols it took to trigger the feature. Each of these will reveal a cash prize. Free Spins – The free spins feature gives you more chances to win and is triggered when you land three or more ice-cream scatter symbols. Triggering this feature will immediately award you 10 free spins, while the feature itself will offer the chance to multiplier all wins x3. Landing more scatters on the reels will award 10 more free spins. 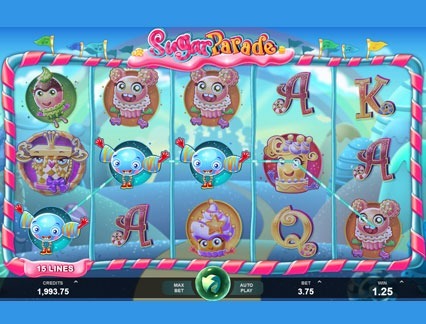 As you can expect from a pokie with this name, Sugar Parade is a visually appealing game, packed with cute characters and bright colours. Featuring a candy theme, the graphics are cartoony without been overly childish, while the sounds effects are equally appealing. There are five high value symbols, all in the forms of some or other sugary snack, although each features a cute face that is difficult to ignore. 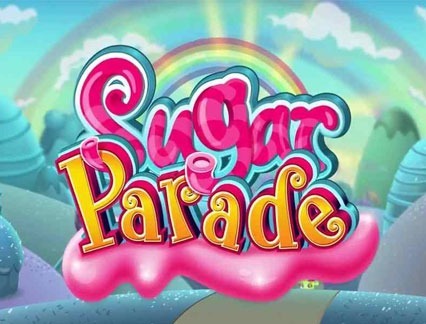 The Sugar Parade logo is the wild and replaces all other symbols on the reels to form winning combinations, except for the ice-cream scatter and King bonus icons. The lower valued symbols are represented by the Q, K and A. While Sugar Parade is not a progressive jackpot game, players can still enjoy a healthy payout of 8,000 coins. The game is a low variance game, making it great for new players, while a good jackpot will appeal to seasoned players as well. With an RTP of 97%, players can expect some nice payouts and a fairly simple gameplay that will excite, entertain and reward. Sugar Parade’s biggest feature is the free spins round, which awards players with generous wins from the moment the feature is triggered. The free spins round is triggered when you land three or more free spin scatter symbols, giving you a cool 10 free spins right off the bat. What’s more, all free spins are subject to a 3x multiplier and award more free spins every time you land more scatters.